Stonehenge is Britain’s largest and most famous stone circle, or henge, and archeologists have been debating the origin of it’s existence for generations. It is located on a plain about two miles west of a town called Amesbury, about 90 miles west of London, and it is thousands of years old. 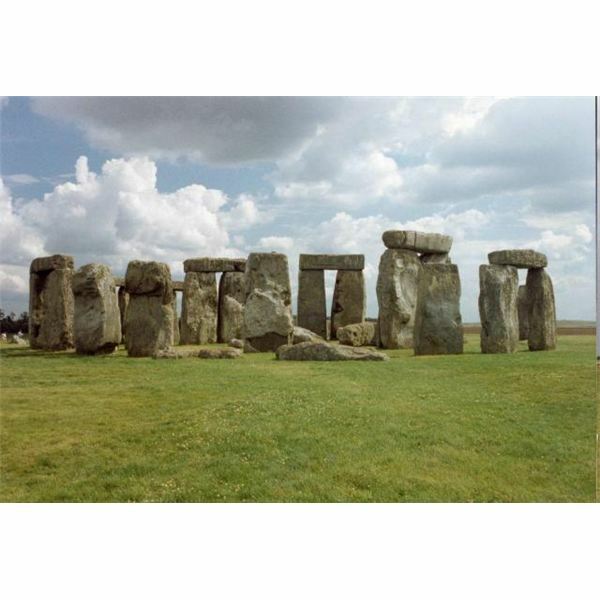 Many mysteries surround the henge, and historians have believed various things over the years. At this point, though, they are fairly certain that they know who built Stonehenge and how. The only real question that remains is why. The henge surrounds a large stand-stone known as the Altar Stone. The Altar Stone sits in the middle of a horseshoe of smaller stones called bluestones, which came from Pembrokeshire in the north of Wales, about 240 miles away. Although these bluestones are in a horseshoe shape around the altar stone now, archeologists think that they were probably arranged in a full circle at first and moved later. The bluestones each weigh about six tons, and there were once 60 or more of them at Stonehenge. Outside the horseshoe of bluestones, there is a second horseshoe of bigger stones, called sarsen stones. The sarsen stones came from 20 miles away, and weigh anywhere from 20 to 50 tons. The opening of the two horseshoes faces Stonehenge’s entrance, to the northeast. The outer-most ring of Stonehenge is a complete circle of smaller sarsen stones with another large stone, the Heel stone, marking the entrance. At the Summer Solstice, the longest day of the year, the sunrise aligns perfectly with the entrance and the Heel Stone, and at the Winter Solstice, the shortest day of the year, the sun sets right behind the Altar Stone. This leads archeologists to believe that the henge was built for religious purposes. Who Built Stonehenge, and How? 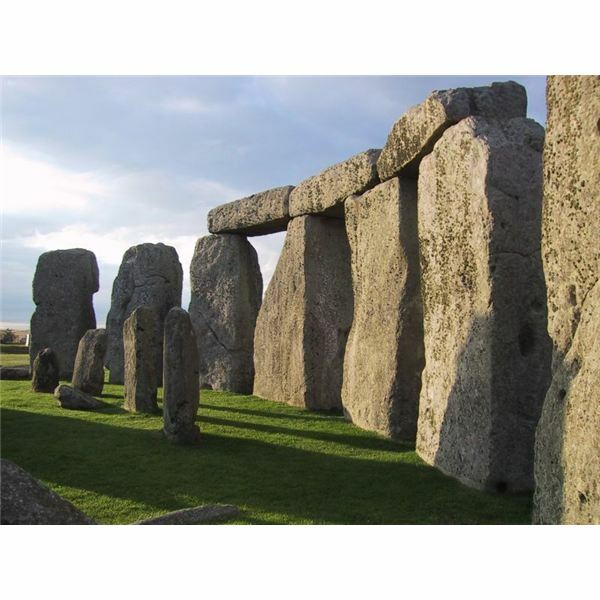 Many people believe that the henge was built by the Druids, however, the monument dates back to before the Druids, and was probably built by Neolithic people called the Beakers sometime between 3000 and 2000 BC. Part of the mystery surrounding the stones is how prehistoric people could build a structure so complex and use materials so heavy without any machinery to help them. The actual business of erecting the stones was probably not even the hardest part — they likely did it using levers, ropes and pulleys. The greatest challenge would have been transporting the stones to the site. The bluestones were probably carried on rollers or dragged on sledges overland from Wales, with as much as possible of the journey being done by sea. It would have been much easier to sail around the south of Wales and then take rivers inland to Somerset than to roll or drag the stones across the land. The sarsen stones didn’t have nearly so far to go but are much bigger and had to be carried overland. Archeologists believe that moving the stones past some parts of the route would have required 600 men. Stonehenge was not completed in one generation — in fact, it probably wasn’t finished until around 1500 BC, meaning that the henge took anywhere from 500 to 1500 years to build. The people who began the construction of Stonehenge knew that they couldn’t possibly live to see it completed. What purpose was so important that generations of people devoted their lives to transporting and erecting massive stones in this pattern? Modern knowledge of Stonehenge stops here. No one is certain why the henge was built. This is one of the great mysteries of Britain and one of the reasons Stonehenge is so fascinating to many people. There are a large number of theories as to why Stonehenge was built. Because of its astrological associations, some people believe it was used as a sort of calendar, to mark the passage of time; some people believe it was used for religious ritual associated with the turning of the seasons. There are burial mounds nearby, so another theory is that Stonehenge had some purpose connected with funerals, sacrifices or the Beaker people’s Underworld. The fact is, though, that no one really knows. What’s your theory?